'Mr. Chico Texas' is the latest, mega fast food enterprise in the country. American-franchised, glamorous and inviting, the restaurant is a marked presence in the fast developing suburb of Nugegoda. 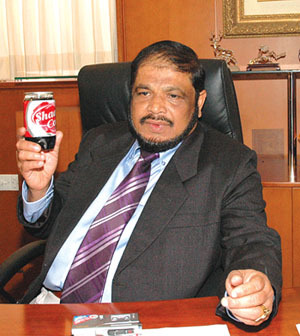 However, it is not just another fast food business, its owner and veteran businessman Mahinda Ramanayake, Chairman, Jaycey Group of Companies explains in this interview. Expo Lanka Holdings Ltd. launched its new logo and tagline January 19 at the Hilton Hotel, Colombo. The company believes that the logo brings to life, the vision, the mission, values and the philosophy of the group. Engineers and technologists in the computer industry should try to develop their own systems, said Principal Consultant, Metanoia Inc. California USA, Dr. Vishal Sharma. Sharma who would be making the keynote address at the South Asia's largest Networking Conference, SANOG IX today at Trans Asia said that in about five six years there would be a lot opportunities in this area. ASEAN - Single market like EU?